2016 was a great year. Personally, it was pretty cool because I got to marry my favorite boy; my little sister moved to Columbus and we had an inaugural Christmas party in our new home. Oh yea, and I started this blog! In the world of travel, I got to do some pretty cool things this year and it’s been a great experience sharing it with you. I thought it would be wise to sum up 2016 in the event you missed some of the highlights – it’ll be a photo-heavy recap, some food is involved (duh!). Enjoy! 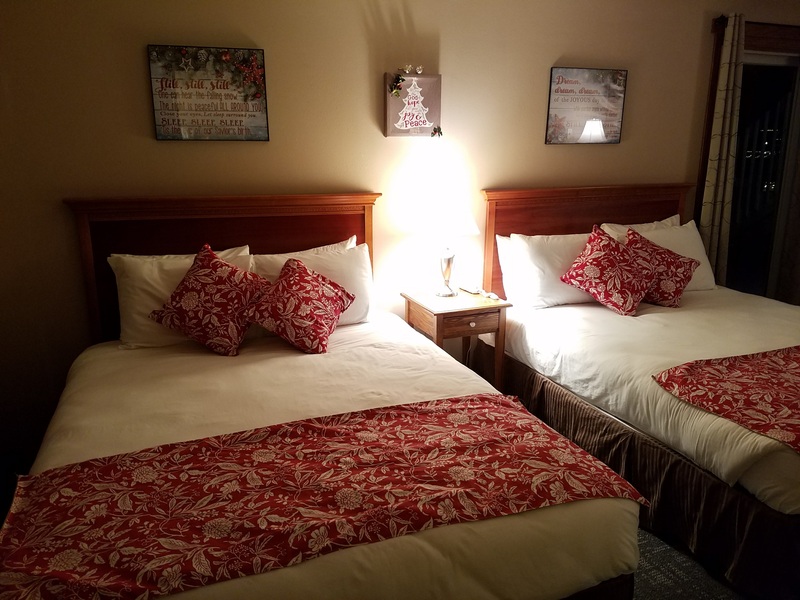 I visited Kalahari for the first time ever (!) and also the first of three times in 2016. In March I was attending the Meeting Professionals International Mid America Conference (MAC). I learned a lot and met some great new friends. I was also recognized for receiving my Certified Meeting Professional (CMP) Certification, which is pretty cool! Also in March, I got to see two brand new hotels – one open and one not quite open! I was able to visit the new Kimpton Schofield Hotel, just after opening. 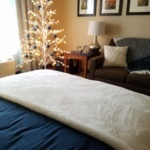 We returned to stay overnight in May, when the idea for the blog came to fruition! 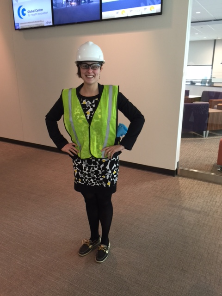 I was fortunate enough to get a hard hat tour of the new Hilton Cleveland Downtown. It was SO COOL. 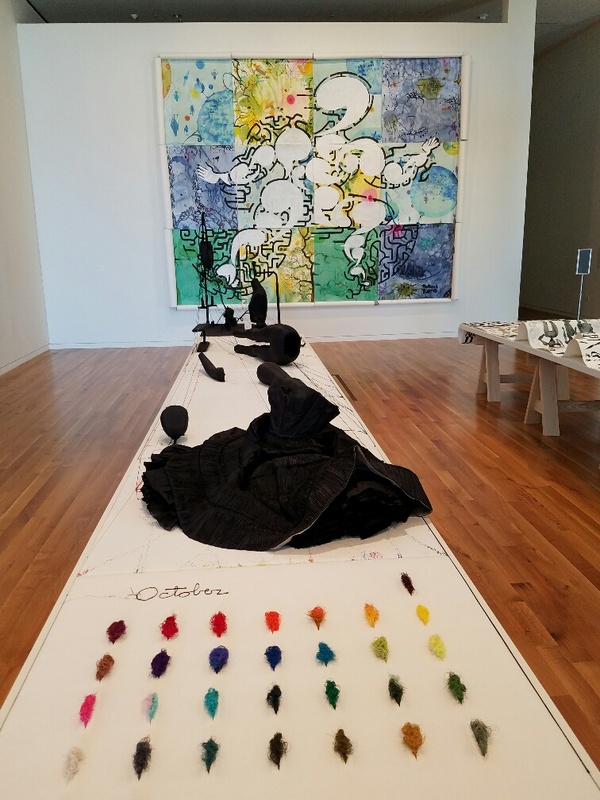 If you haven’t been there yet (it’s open now!) please go check it out. Whether you’re there to see the living wall in the lobby, the lake views from the rooftop bar or to eat at one of their awesome restaurants, it’s worth the trip. I can’t help but first point out – I got married! This was by far the coolest thing that happened in 2016. But, before all of those shenanigans, I had a Bachelorette Party. Don’t worry folks, this blog is pretty PG. I’m not your typical Bachelorette Party Go-er. I’m super lame. Really, all I wanted were my best friends in one place that had sunshine. After all, I didn’t want to be the same color as my wedding gown (Boo!). 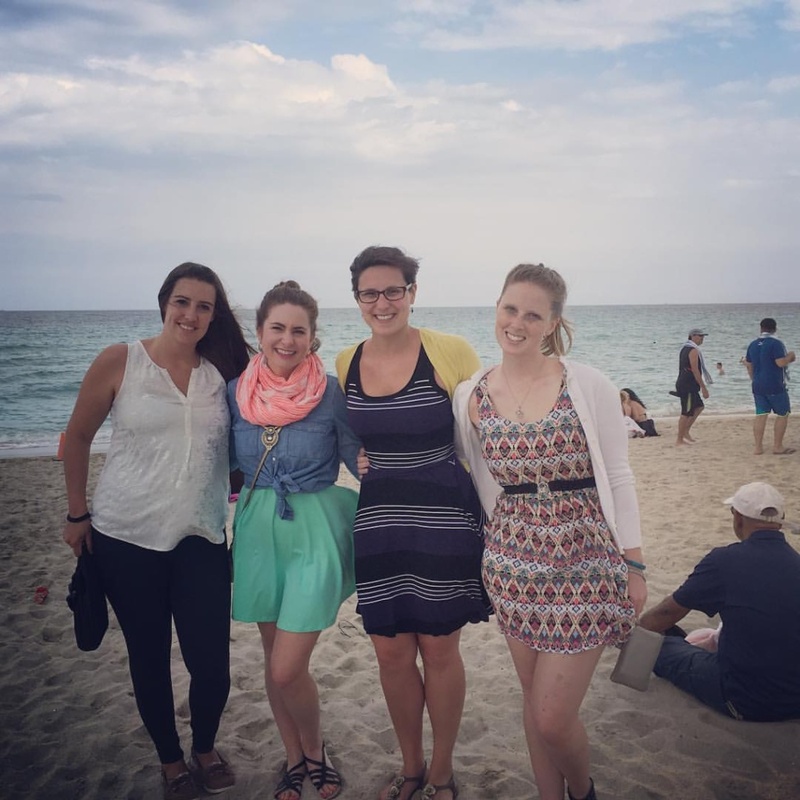 My girlfriends and I got to stay at the BRAND NEW Residence Inn Miami Beach South Beach. The hotel has just opened and it was super flashy. It wasn’t anything like what you’d see in Ohio, but then again, is anything in South Beach like Ohio? Following our wedding, we visited Punta Islita, Costa Rica. We chose to stay at the Hotel Punta Islita which is an Autograph Collection property frequented by the rich and famous. We didn’t get to meet any celebrities, but we had an awesome time. 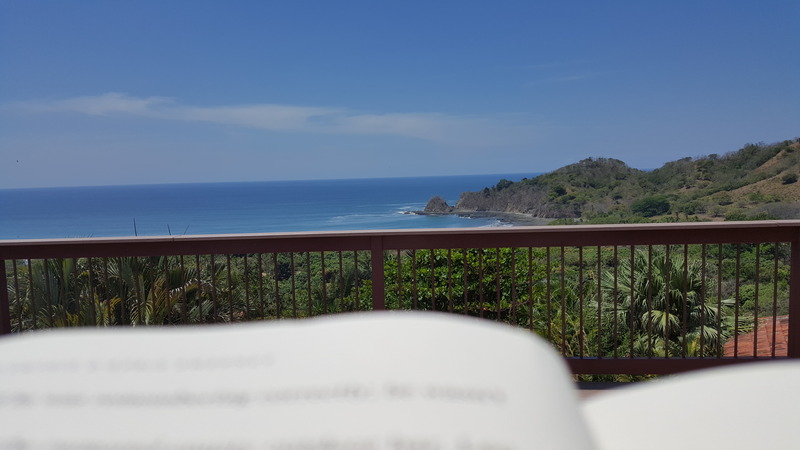 When I’m on vacation like this one, my routine is pretty simple – wake up, do a non-traditional workout (hike a mountain, swim in the ocean, beach side yoga…), eat breakfast, sit by the pool and read, eat lunch, sit by the pool and read, eat dinner – repeat. This is the view from my book. What happened in May is pretty spectacular. TJ and I were sitting in Adega after a long holiday weekend. I’m sipping my tea, TJ his coffee. We’re playing one of our favorite post-trip games, “What was your favorite part?” when it happens. It was TJ’s idea. I can take no credit. InnLove was born. One of the coolest things in June was the ability to share one of my favorite things with other people. Maybe you haven’t picked up on this yet but I work in the hospitality industry. One thing I know you have picked up on is that I love to eat. Any chance I have to put those two things together for work – IRRESISTIBLE! 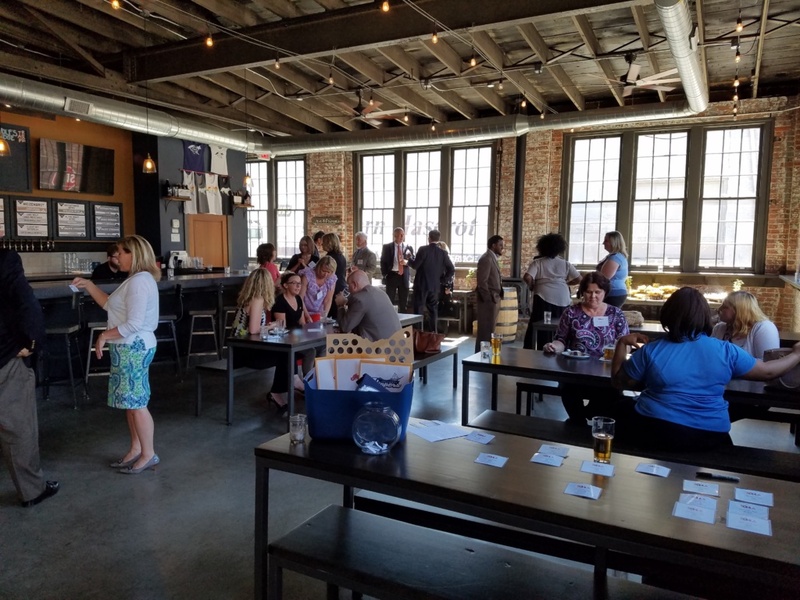 In June, I was able to host a hospitality reception of sorts at one of our favorite places in Columbus – Wolf’s Ridge Brewing. TJ goes for the beer, I go for the brunch – Toad in a Hole is hands down the BEST BRUNCH food I have ever had. Sadly, I didn’t get to share brunch with my guests, but we did get to break in the brand new WRB Taproom. If you haven’t been there yet, go. I’d start with brunch. Oh July, how I miss you. 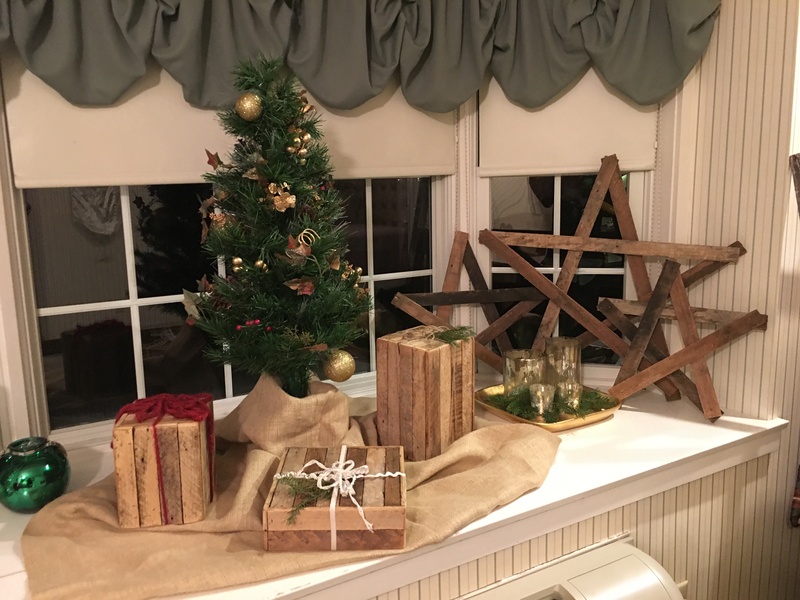 That might seem crazy, but more crazy is that I divide my year up into two major events – Christmas and July (not to be confused with Christmas IN July). We go on our family vacation every July to Ocean Isle Beach. It’s the best. It is so easy and we just sit around in the sun for a solid week. This year was particularly cool because we actually discovered something new! Guys, when you go the same place nearly 30 years in a row, it’s hard to break the mold, but this year it happened. My parents found this super cool hotel that I guarantee will become part of the annual experience because our time there was that great. 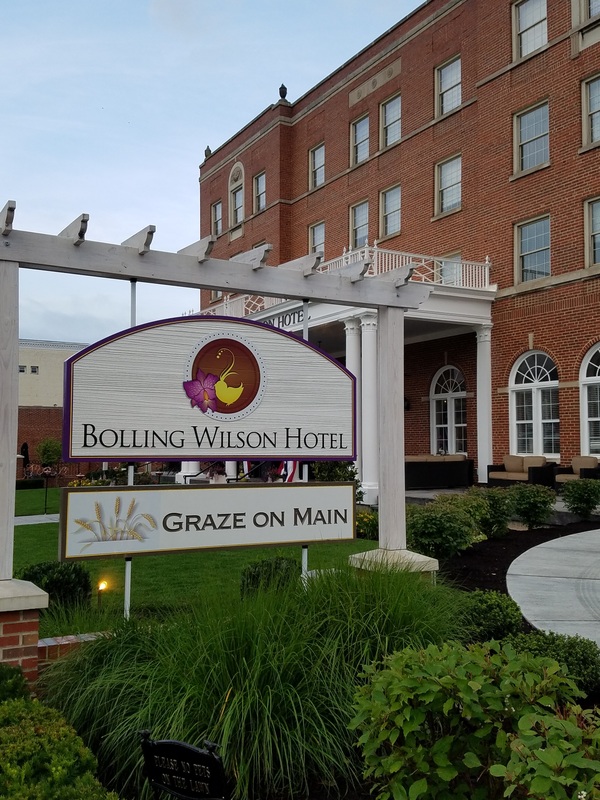 Tucked in the little town of Wytheville, VA along I-77 is the Bolling Wilson Hotel (and, also important…their restaurant, Graze on Main). What a fabulous find. 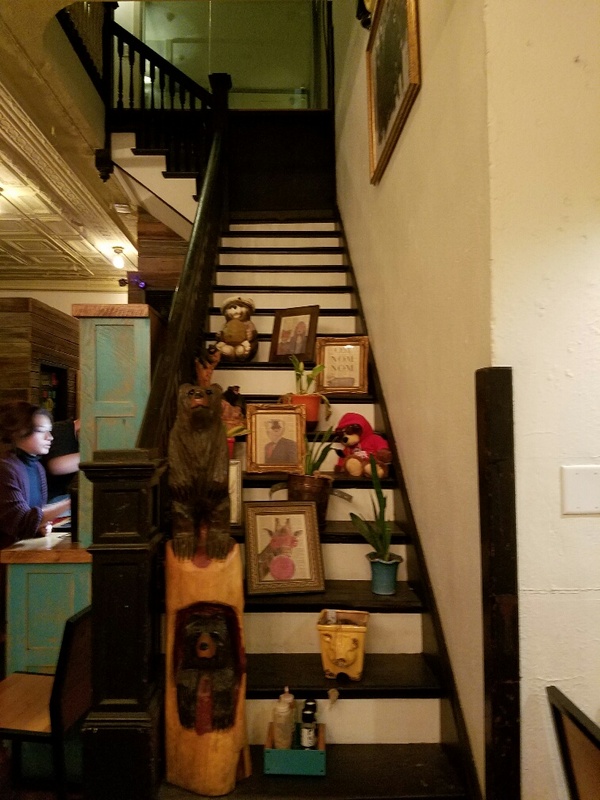 If you want to read more about it, let me direct you here…Ascending to New Heights in Wytheville, VA.
Summer was super busy for me both personally and professionally. 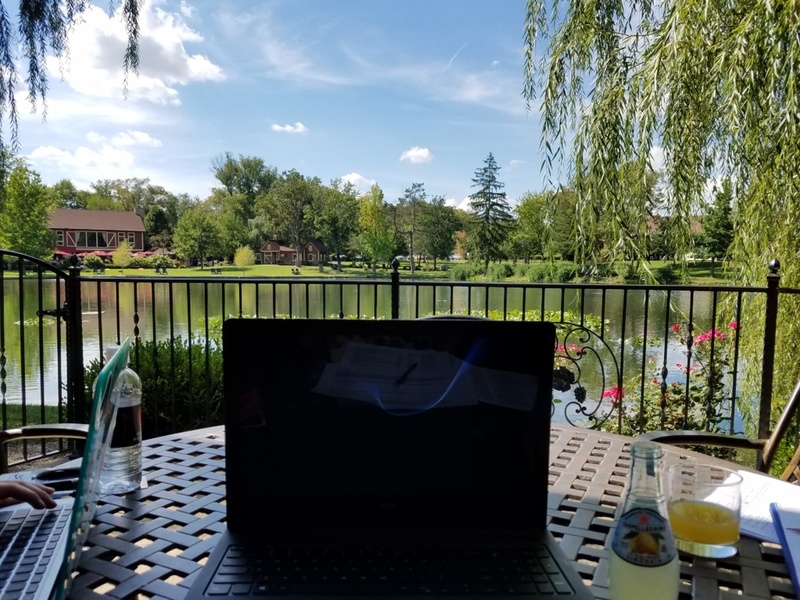 I had the awesome opportunity to round out a fabulous summer travel season with my first trip to Gervasi Vineyard. Gervasi is located near my hometown, so the chances that I’m in that area and not just staying with mom and dad are slim. I am SO GLAD I went! 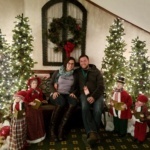 The Villas at Gervasi are super romantic and luxurious. I had a fire by my bed (I totally turned it on at bedtime even though it was easily 80 degrees out. ), refreshments in the common area and a beautiful patio overlooking the pond. The dinner served at The Bistro was top notch and the atmosphere was that of the valleys of Sonoma or Napa, not Canton, OH. 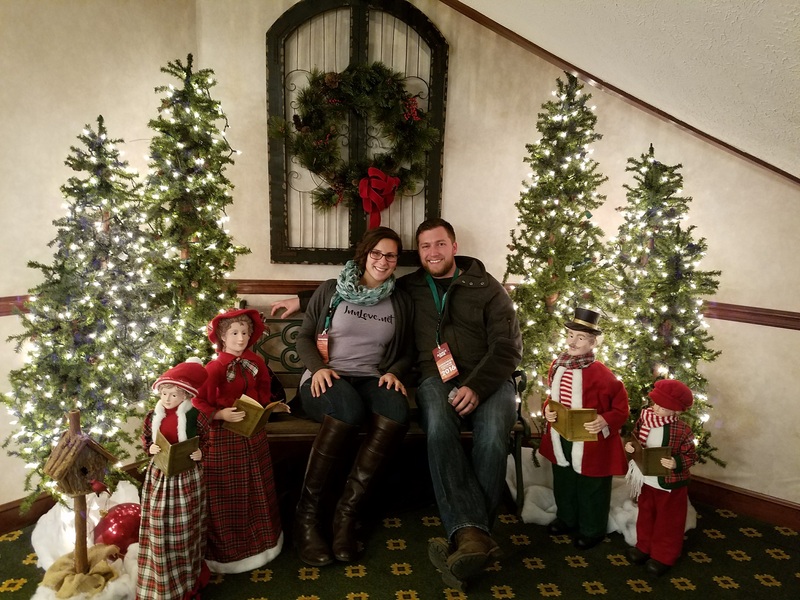 If you haven’t had a chance to lose yourself at Gervasi – do it, before everyone finds out! 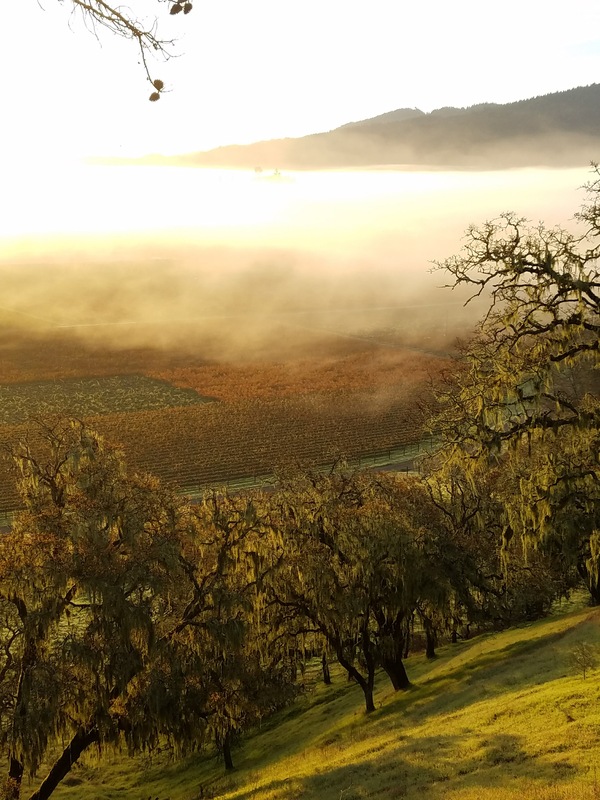 Not to be outdone by Summer, Fall came swirling in in grand fashion. Remember that post about sleeping in 5 different hotels in 10 days or something absurd like that? That was in the month of September. So here, I feel like I really need to narrow down the best of September, but truthfully it’s easy and in the light of the most recent events, I think it’s important to highlight the beauty of Gatlinburg, TN. We were called to Sevierville, TN for a wedding the last weekend in September. It was the final stop on a month long travel rodeo and we were beat. 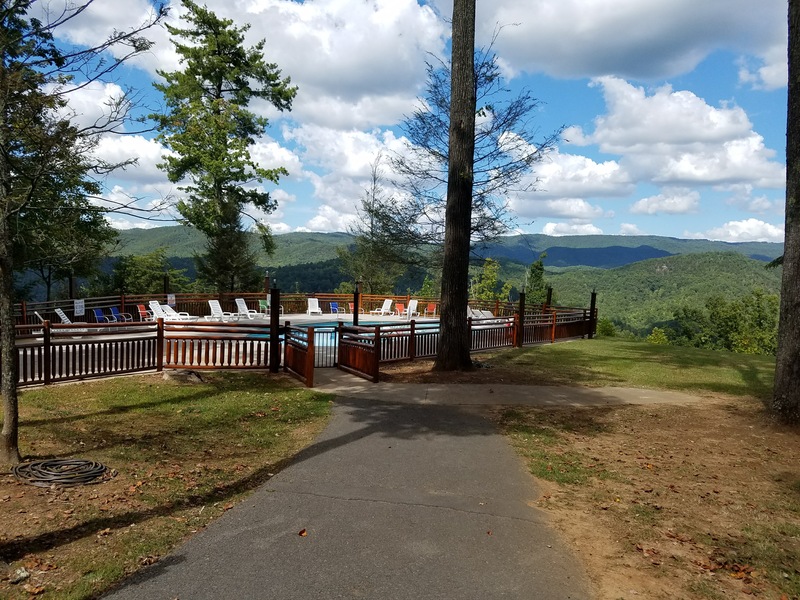 I couldn’t have been more relieved when I discovered where we would be spending a long weekend, celebrating the marriage of one of my childhood friends. The setting was majestic and the cabin we stayed in was super cool. We had a lofted bed in a room with floor-to-ceiling glass on three walls that made you feel as though you were quite literally sleeping in the trees. I cannot wait for the opportunity to go back, because Gatlinburg and the surrounding communities will come out of this year’s tragedy with a stronger and even more impressive travel experience to share with the world, mark my words! Brunch: Hoof Hearted Brewery – Columbus, OH Those house-made biscuits. 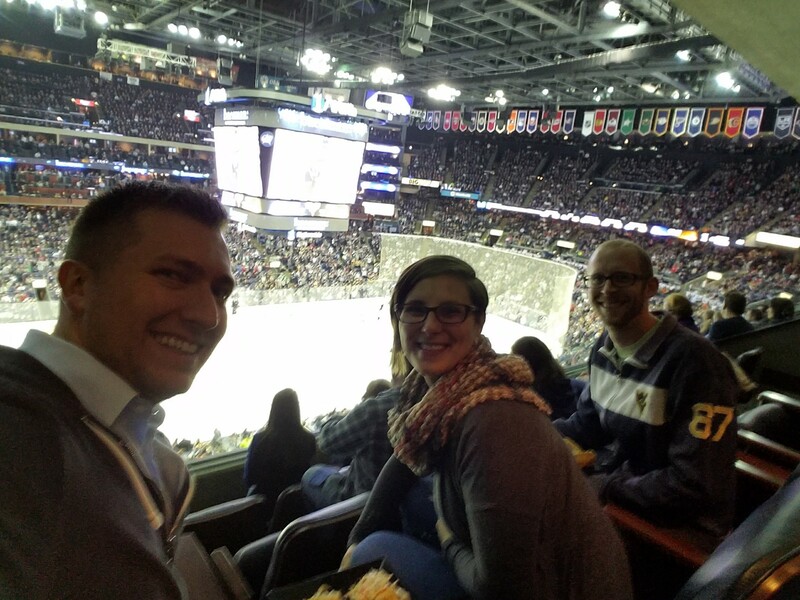 Entertainment: Columbus Blue Jackets How have I never been to a hockey game?! SO. FUN. November was cool because we got to do some fun things for TJ. In all honesty, my calendar dictates a lot of our schedule. He is a good sport for going along with everything I try to cram into our lives. Each year, my West Virginian plans a trip to Morgantown, WV to visit with his friends. We all know by now I love traditions and one of my favorite fall traditions is the drive along the West Virginian “ridges” (those are the winding roads of the mountains for us Ohio folk) to Morgantown. I haven’t had a chance yet to cover this expedition in the blog, but I want to share a quick snip of this particular trip because it was so fun. We had our first snow of the season on a frigid night in Milan Puskar Stadium. 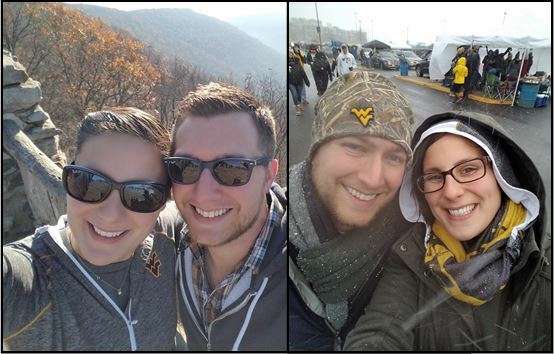 I actually had one of our property members tell me that she has always wanted to experience a football game at Mountaineer stadium. I’ve gotta tell you, kids, the emotion wrapped up in 60,000 fans singing Country Roads at one time is something else…even for a Bearcat. 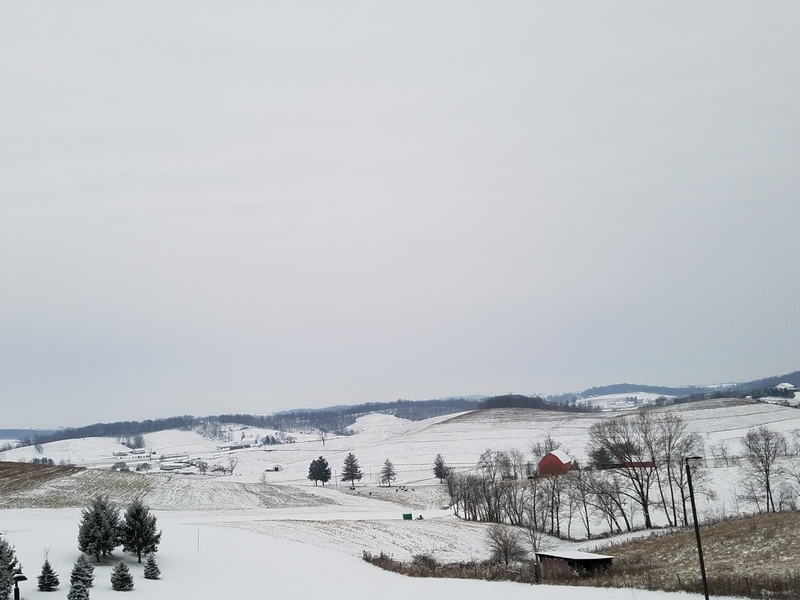 This photo does depict how similar WV weather is to Ohio… one day it’s sunny and warm, the next day it’s snowing and frigid. Here’s to seasons! December. Much like July, it has really been a highlight of our year. We were able to take a trip to Napa that was unreal. You haven’t read about it yet, as it will be the opening piece for 2017. But, I do like to share gifts this time of year, so here is a little snip it to tie you over until then. Isn’t it beautiful? I will not be posting again until January 6. See you next year! I’m Back! And My Belly is Full of Cookies! I’M BACK! I seriously missed you guys. Traveling is hard work! A quick “thank you” to Christi and Cindy for stepping in and sharing with you some of their most recent experiences! If someone blindfolded you and dropped you at the Guggisberg Swiss Inn you would think you were in Switzerland. 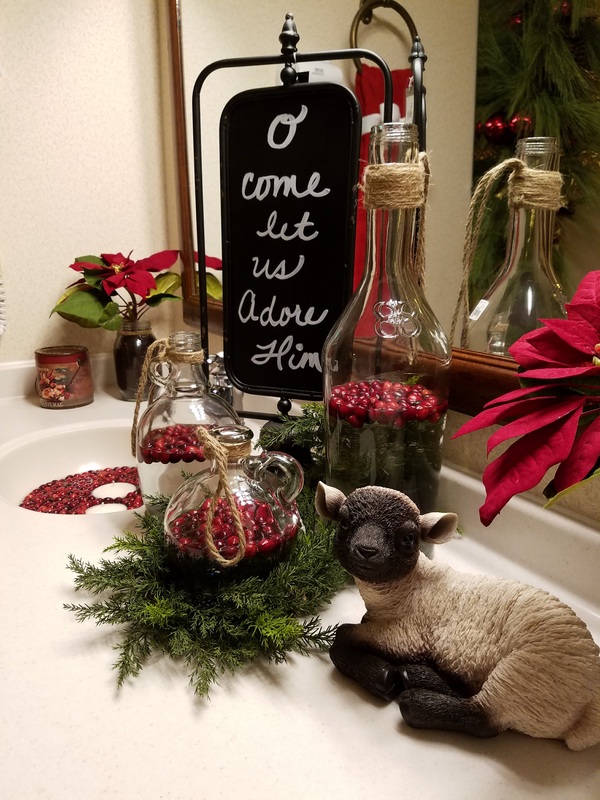 Holiday décor aside, innkeepers Julia and Eric Guggisberg have done an excellent job of making this inn feel authentic. One of my favorite aspects of the inn, although I didn’t get a chance to snuggle them this year, are their horses. They roam free on the property and are happy for a pet or to take you on a trot around the property. 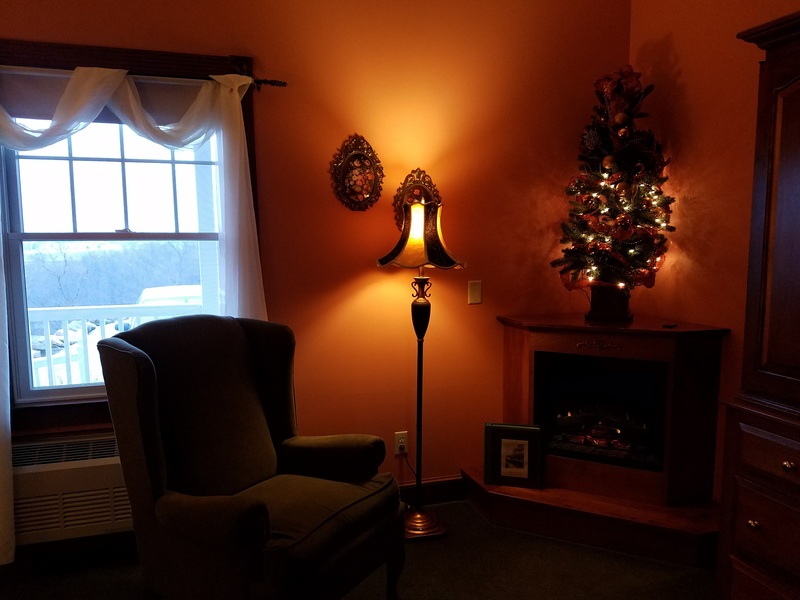 Decked out for the holidays, the Guggisberg Swiss Inn is exactly where you picture yourself with a warm mug of hot chocolate and a book. As always, at this stop, you can taste some of their Doughty Glen Wines! Every. Time. 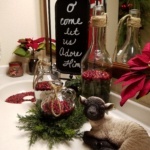 Innkeeper Loretta Coblentz out does herself. The Barn Inn is magnificently decorated for the holidays – although she gives her staff all the credit. 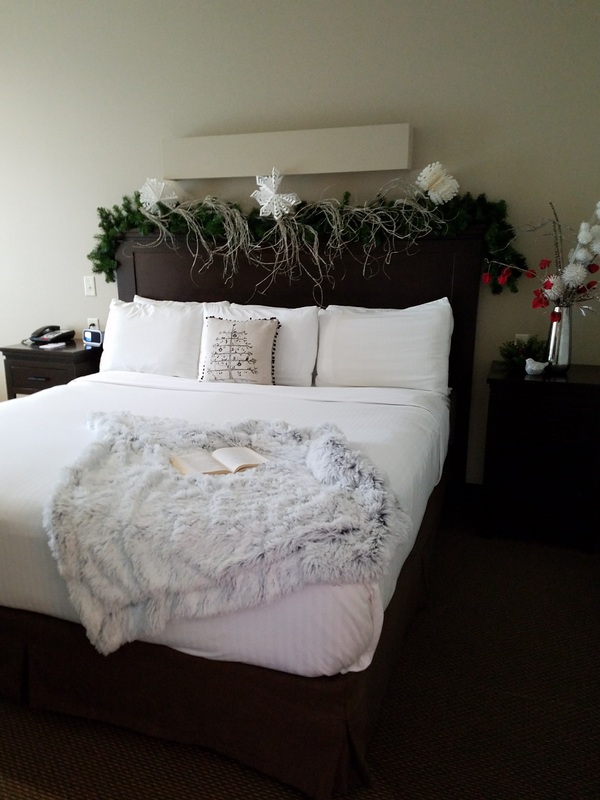 Each guestroom is immaculately appointed, each with its own holiday theme. 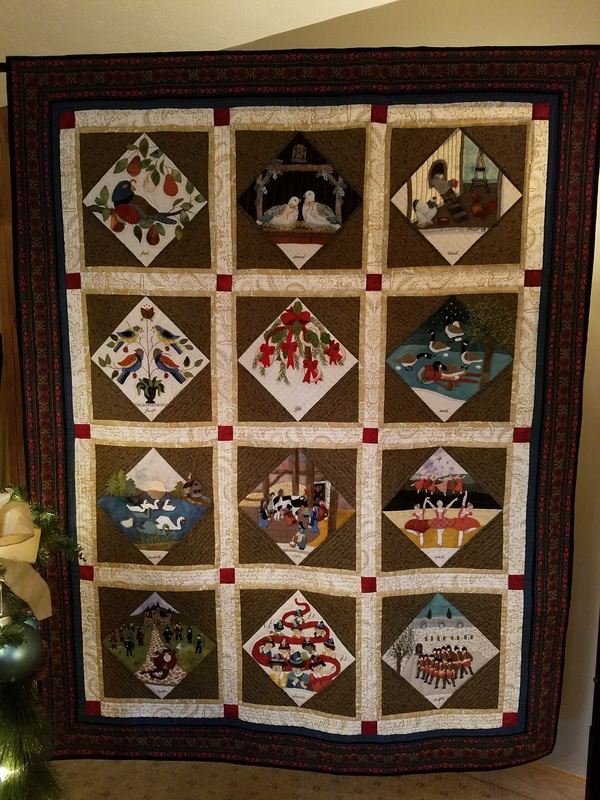 Some extra special touches are always waiting for you at The Barn Inn – quilts handmade by Loretta (check out this one that is the 12 Days of Christmas!) 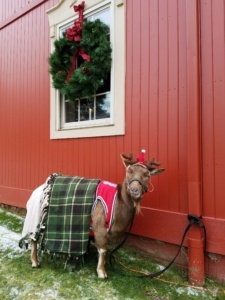 and during the tour, this sweet little goa—ahem—reindeer greets you at the door. Yowza! 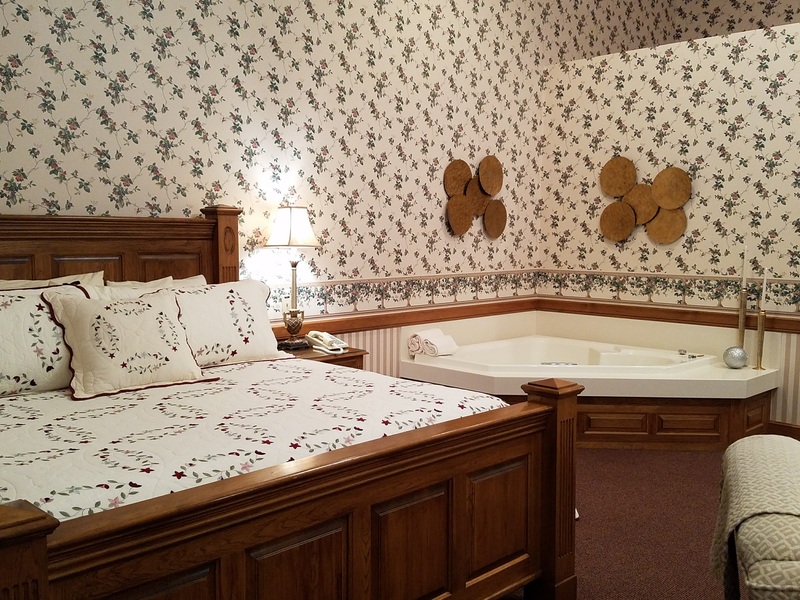 Talk about a non-traditional Amish Country lodging experience. The new suites at the Berlin Resort are top of the line. Covered in all things shimmery and glittery for the holidays, the Berlin Resort is the type of place I want to have a Girls Weekend. The massive suites building is ideal for a Bridal Suite or the whole family! 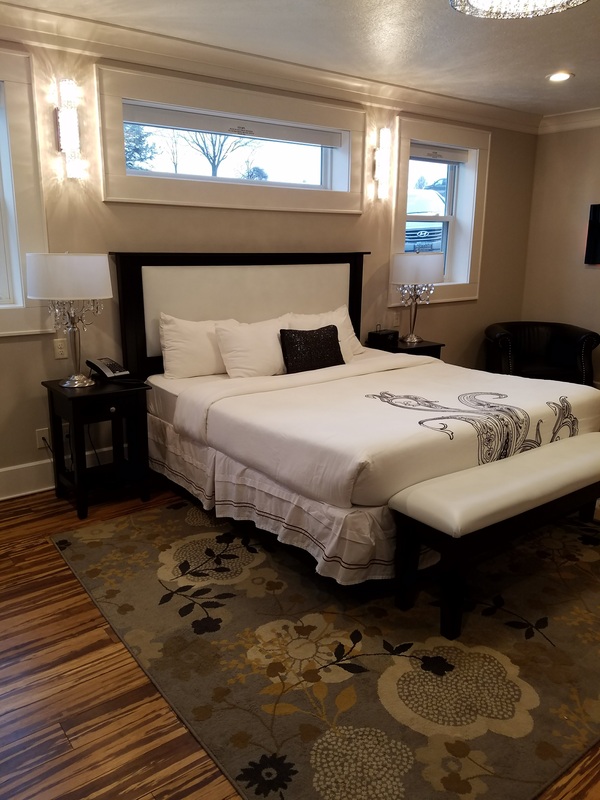 Rooms are cleverly situated to continue to be joined until you have just the right number of impressive bedrooms, fireplaces and enormous bathrooms to suit you and your guests. I couldn’t get over the views from the suites facing the lake. The crew here did a great job of accenting the contemprary nature of the design with the contemporary Christmas pizzazz! businesses in the area at the end of the tour too – those cupcakes were phenom! Always one of the hot spots on the tour, the Berlin Grande Hotel was pulsing with holiday spirit and people! The tree that greets you in the lobby is nothing to contest with. One of my favorite decorations on the tour was what we playfully called the “Winter is Coming” room (Game of Thrones – anyone?). 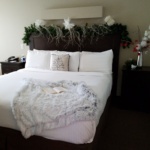 The white fur blanket on the bed was a luxurious touch! At this point in the tour, I was ready to cozy up for a nap with that blanket. This stop is also the hub for the shuttle that takes you to two more stops – onward! Wow. This is the first time I’ve been to this property and I was glad we went. 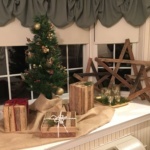 Innkeepers were welcoming guests into a warm cozy living room (it was freezing that day!) and Jim was busy cookie (I’m going to leave this typo here to give you a sense of where my mind is at…) COOKING** up a special Apple Cider on the stove top – complete with whipped cream and spice! The rooms at this inn had the highest ceilings! 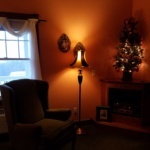 I found one of the best wingback chairs near a fireplace at this stop. If I’d only brought my kindle! Also a new stop for me on the tour and we were impressed. Far removed from the bustle of downtown Berlin, this little spot is a great “get a-way.” The main room was packed with people clamoring for an iced Ginger Cookie (my favorite cookie of the tour!) 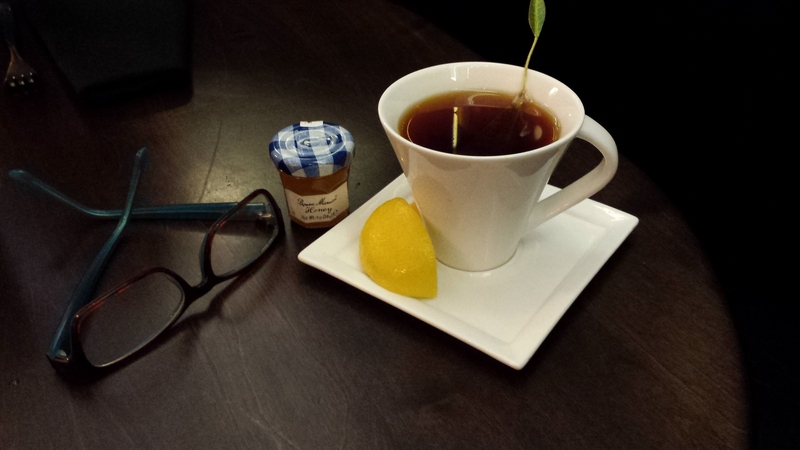 and some of their German Tea. We snagged a tea and headed to one of the cottages. The cottages would be a great place to spend a weekend away from home – no doubt! 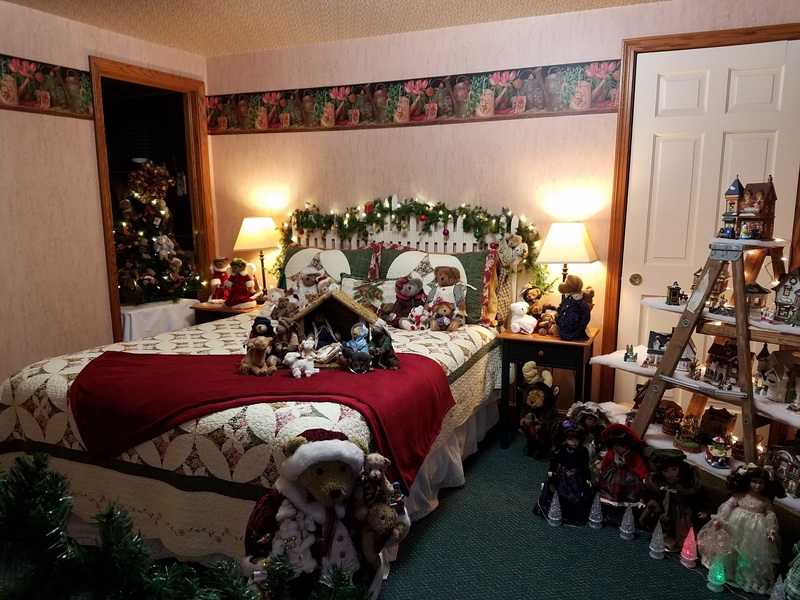 I also loved their Teddy Bear Christmas Room – something unique for the tour! Exhausted yet? We should have done this in two days for sure. Luckily, the crew at Oak Ridge Inn was ready to save the day. Not only did they have our cookies, but little containers of grapes and cheese. After all, it was almost dinner time and we were working hard! 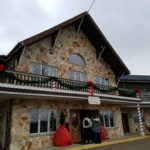 I have visited several Nivea Hospitality properties but the Oak Ridge Inn was something different. Right around the corner from the ultra-modern Wallhouse Hotel Walnut Creek, this quaint little inn is tucked back off the main drag. 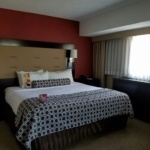 The guest rooms here are massive with big Jacuzzi tubs and fireplaces waiting to help you unwind. Definitely worth a longer visit (and soak!) next time I’m in town. Talk about competing with your siblings. 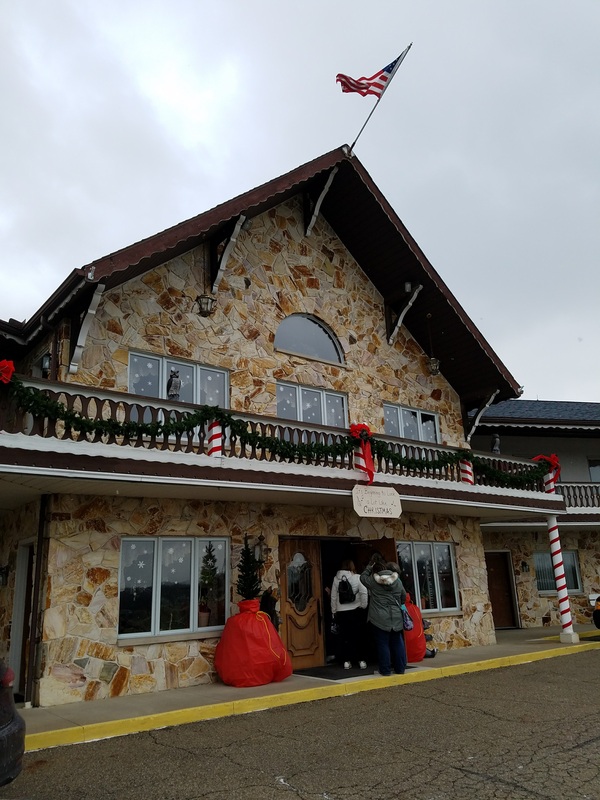 The Carlisle Inn Walnut Creek and Carlisle Inn Sugarcreek were battling it out for most over the top, awe-inspiring, jaw-dropping holiday display. The Christmas tree at the entrance to the Carlisle Inn Walnut Creek is impressive to say the least. Actually, the cool thing about this place is there are many entrances. We came in from the “bottom” level and were greeted by a secondary lobby display where we were able to snap an official blog picture (Check out that shirt!). Carlisle Inn Walnut Creek is a big property and they made sure not a corner went unturned. Every inch of the property was dressed for the holidays.Thank you for a great back drop! New Kids on the Block – Welcome! Not totally new, just new to the tour! We are SO GLAD you joined us this year and it sounds like your staff is too! I was pleasantly greeted by the new innkeeper’s mother who was handing out handmade French Madeleine’s – YUM. I was on my way out of the Welcome building when I overheard someone was getting a room tour – so I jumped in line. 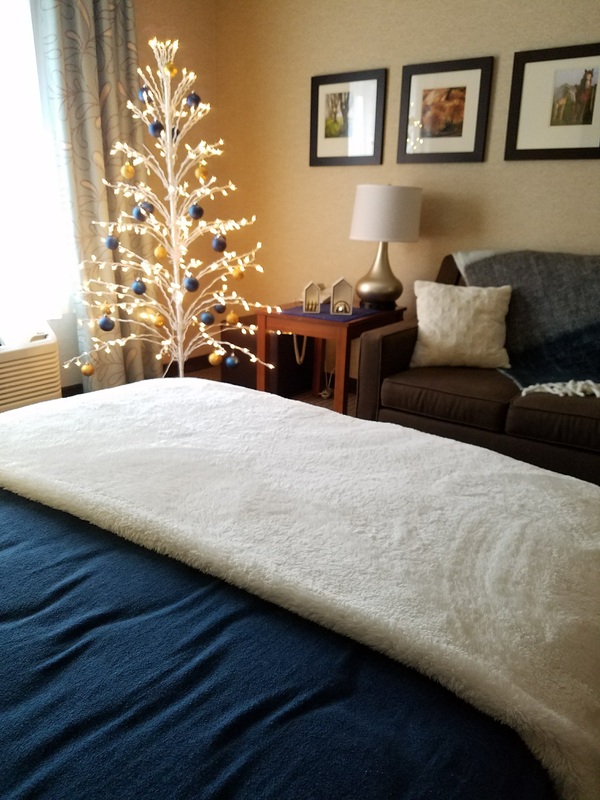 The guestrooms were classically decorated for the holidays with festive wreaths and Christmas trees. 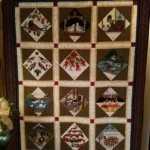 This place is a great stop for a visit to Amish Country – centrally located, easy to access and great hospitality. We made it! 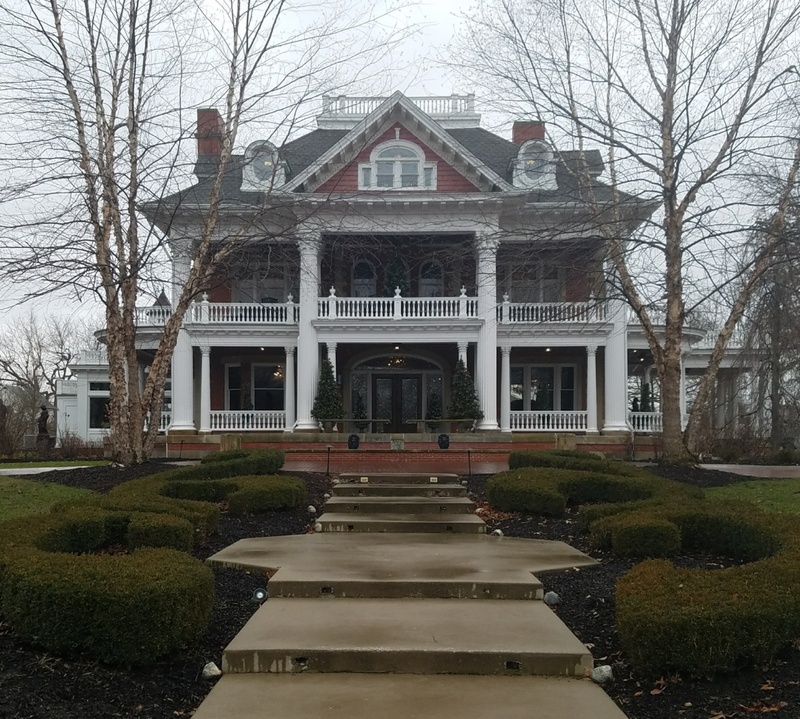 Not to be outdone by its sister property, the Carlisle Inn Sugarcreek has an even more impressive tree and lots of them. I have to give them kudos for my favorite room of the day. I took so many pictures of this room and immediately turned to TJ and asked, “could we do this?” to which he rolled his eyes and said, “No. We’re missing a jacuzzi tub, a four-poster bed, a fireplace and a miniature lamb.” SHOOT. I wasn’t the only one taking pics of this room. The photos say enough. Nice work. Sadly, we hit our step count by tenfold, stood in the frigid December air for the shuttle and digested as many cookies as possible, only to come up short of hitting the LAST STOP before the end of the tour. 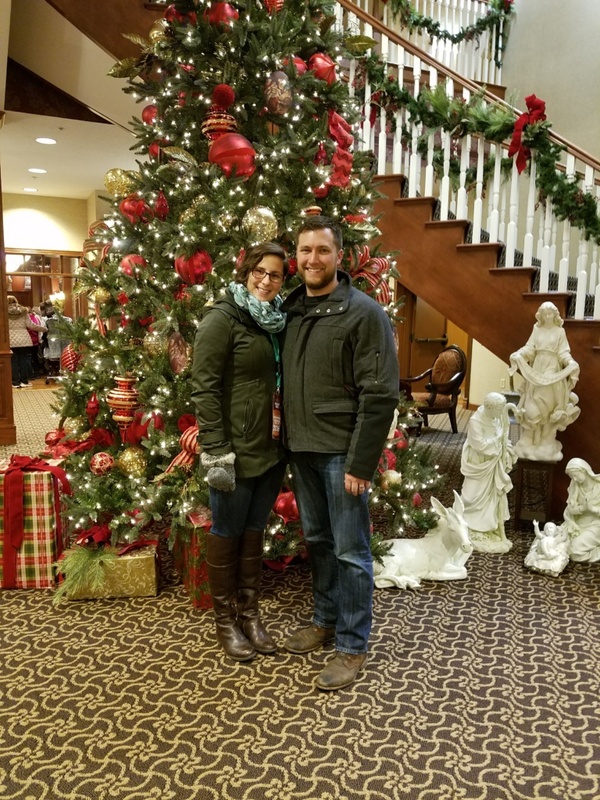 Luckily, I’m from Amish Country so I’ve had the fortunate pleasure to visit the Inn at Amish Door many times before and know that it is an excellent addition to the tour this year. The team there was happy to share some pictures with me to share with all of you so please check them out in the Visual Adventure Gallery! Lesson learned. Two Day tour tickets next year! You may have not have heard my name yet, but I can be found in the OHLA office with Halle, I’m Cindy. The office historian and lover of all things Columbus, Halle asked me to step in while she has been on the road for a few weeks. Don’t worry, you’ll get to hear all about that soon! 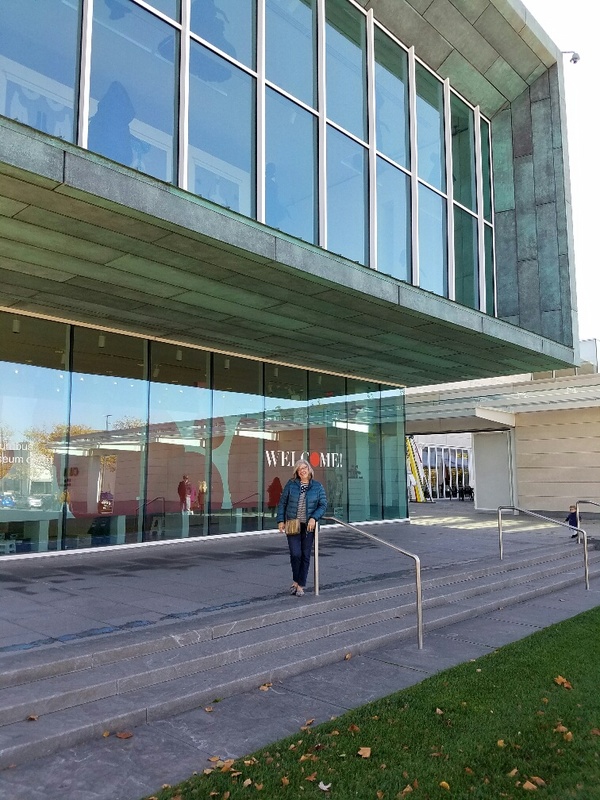 Until then, follow me on an overnight in one of my favorite places – Columbus! 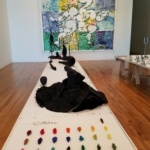 My husband Greg and I had the opportunity for a weekend excursion, “close to home”. We arrived at our Columbus Staycation hotel in time to watch the OSU Buckeyes vs. Maryland Terrapins kick-off — Go Bucks! (I had to get that in here somewhere, you’ll never hear Halle say it!) 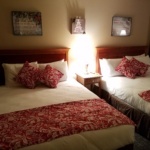 We were staying at the Crowne Plaza Columbus-Downtown for an evening of dining out and a Columbus Blue Jackets game. 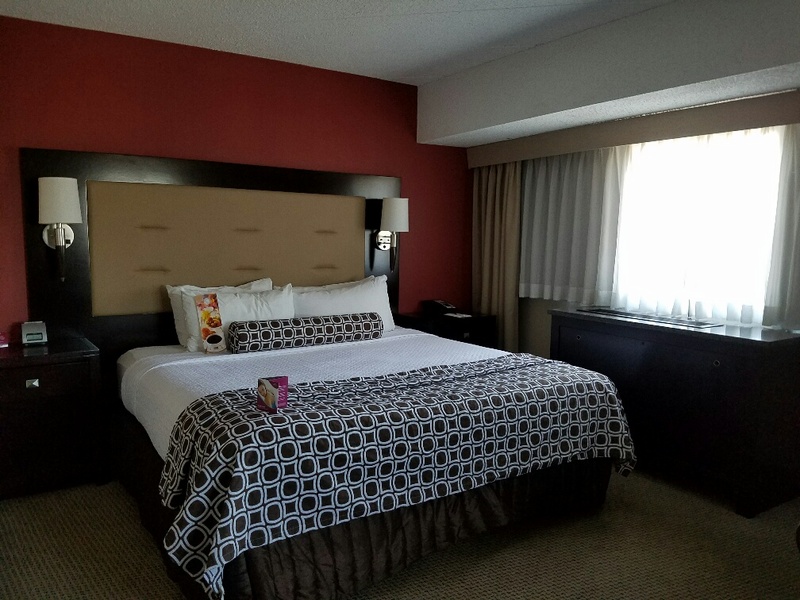 Our room was on the 10th floor with a fantastic view of Nationwide Arena and the surrounding Arena District. Although Halle and I don’t have the Bucks in common – we do both love to eat. 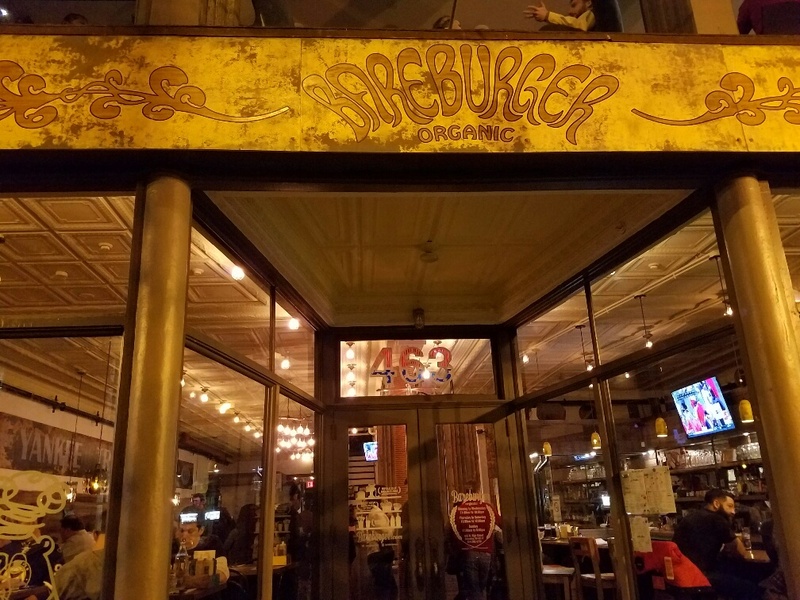 Knowing we could watch part of the second half of the football game while dining, we walked to the Short North Arts District to BareBurger on N. High Street. We enjoyed Bison and Elk burgers while sharing some of the best [Onion] Rings & Fries we’ve ever had. They come with awesome dipping sauces. The restaurant is in a section of the old Yankee Trader party store, an icon of fun costume and party goods in Central Ohio. 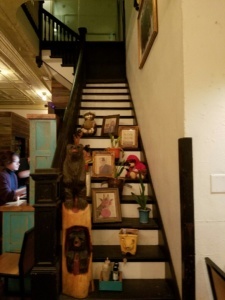 A section of the old stair case was kept to keep the historical nature of the building. It was a short walk on a gorgeous November Saturday night to Nationwide Arena, where fans were lined up see the Columbus Blue Jackets play the St. Louis Blues. Fans were quickly pleased by an early goal which lead to an 8-4 win! A brief walk back to the Crowne Plaza = No traffic hassles, No long drive home! Sunday morning found us at one of our favorite breakfast spots downtown, Mound St. & S. High St.-Dempsey’s Food & Spirits. Always a great quality breakfast in their quaint bar setting. 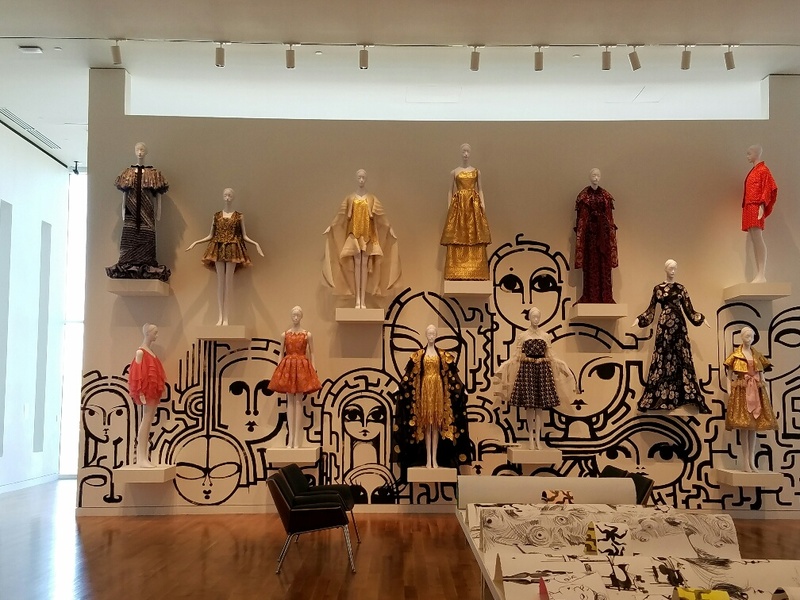 One thing you might not have known about me, I love art and fashion. We arrived home in the afternoon and took a walk at Walnut Woods Metro Park in Groveport. It’s sometimes easy to forget all of the great things your own community has to offer. 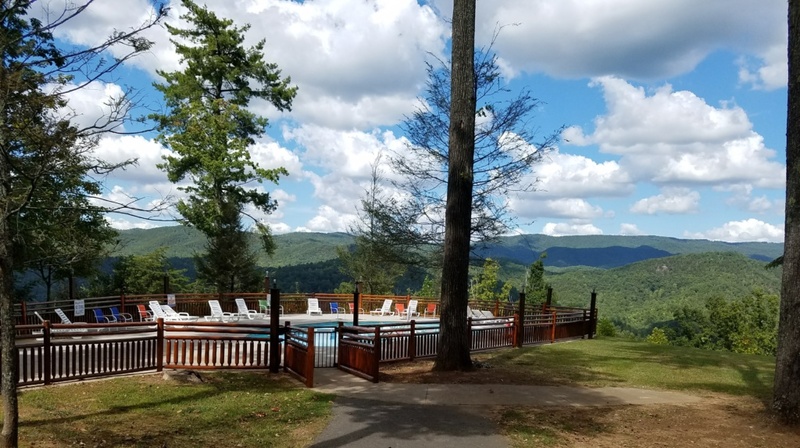 Next time you’re in need of a day or weekend away, consider looking in your own backyard! If you’re in need of some inspiration, Halle and her guest bloggers provide new ideas every week and of course, you can always pick up the phone and call us! Thanks for coming along on my journey with me! 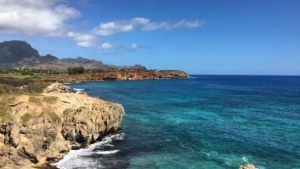 You may say, everyone loves to travel, but I am super passionate about it and I fall in love with most every place I go and Kauai, Hawaii was one of them. I’m in love with several different cities across the U.S and even other countries. My parents are still shocked I haven’t already moved somewhere that I’ve visited. My first time visiting Kauai, was the most unique way to experience a place, Habitat for Humanity: Global Village Trip. You get to take in the culture, meet the locals and work side by side with the families you are building homes for. I got to experience some of the touristy attractions when I was there the first time, but didn’t get to see as many of the sites as I would’ve liked, so of course I had to go back and this time around, I went all out! I planned my trip to Hawaii revolving around a Half Marathon run! What better way to plan a trip then by absolutely having a reason to go! 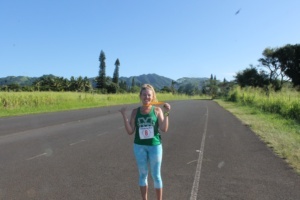 I was set to run The Old Koloa Sugar Mill Half Marathon that started in Old Koloa and ran down through Poipu along the beachfront and back past the Mill. 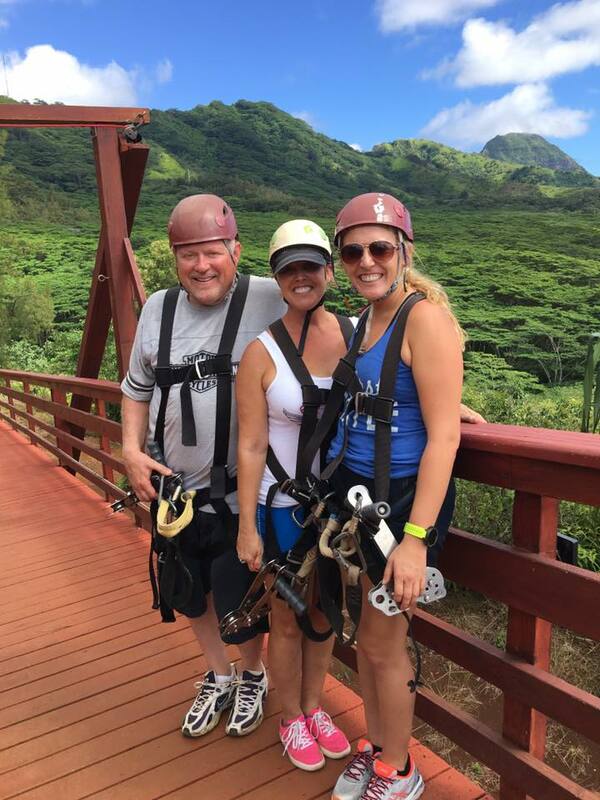 I joined up with my parents in Kauai (their first time). 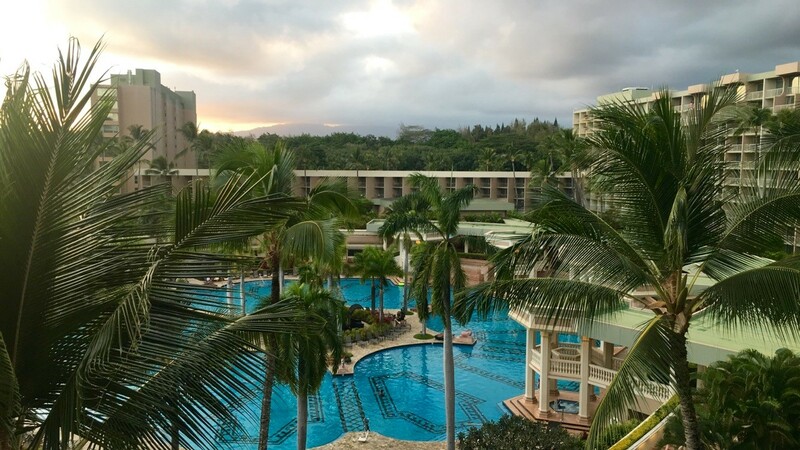 We stayed in a pool and partial ocean facing room at the Kauai Marriott Resort. 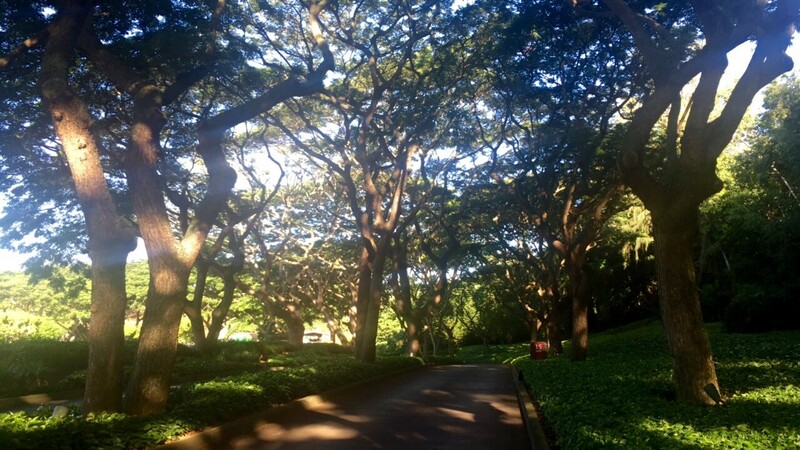 You enter the drive to get to the Marriott and my parents said it made them feel like they were entering Disney World! 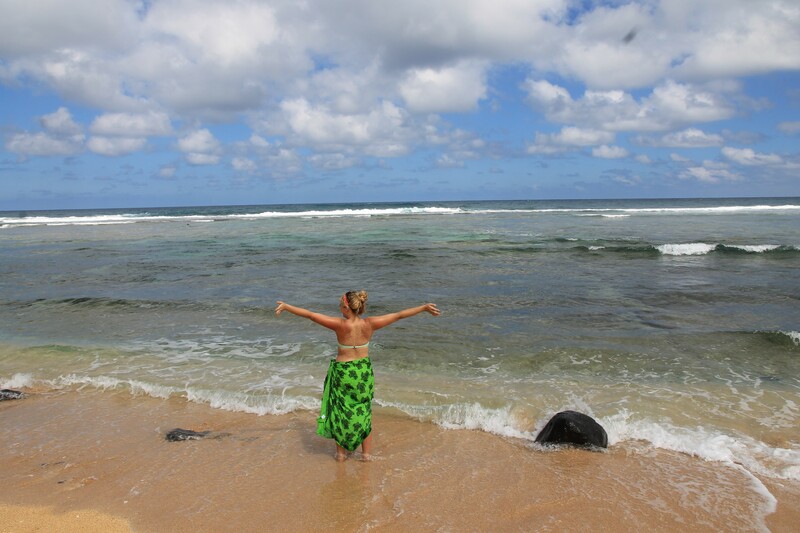 I love everything about Kauai! There are so many fantastic areas on the small island. So I am going to leave you with some of my favorite spots. Kalapaki Joes (The Westernmost Sports Bar in the U.S, in Poipu and Kukui Grove) – This time to Kauai was my first to Kalapaki Joe’s and I recommend it 100 %! You MUST go in with a BIG appetite because the serving sizes are HUGE and you won’t leave hungry! I’m telling you it is fantastic. Please order the onion rings as an appetizer, but make sure you have a big party or else aren’t ordering a bunch of other food! They literally bring you a BOWL FULL of onion rings covered in parmesan and they are DELICIOUS. I wanted to cry leaving some in our bowl, but we didn’t have anyone to warn us of the portions and had also ordered tacos! I had the pork, Skip had steak and mom had the shrimp. They were delicious and very filling as well. We loved the place so much we ended up back at the Poipu location later in the week for breakfast. It wasn’t a disappointment either! Koloa Mill Ice Cream and Coffee (in Historic Old Koloa Town) – If you don’t know me, you wouldn’t know that I am lactose intolerant. 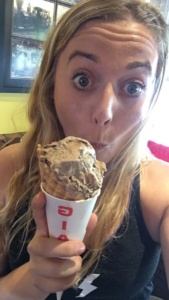 So, now you’re probably thinking, “what can you get at an ice cream shop?” Well, ice cream of course! 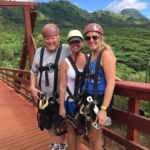 I fell in love with this place when in Kauai on my first trip (we went SEVERAL nights – well worth the sacrifice of my stomach) and I had to take my parents back! It is DELICIOUS. Go try it for yourself. 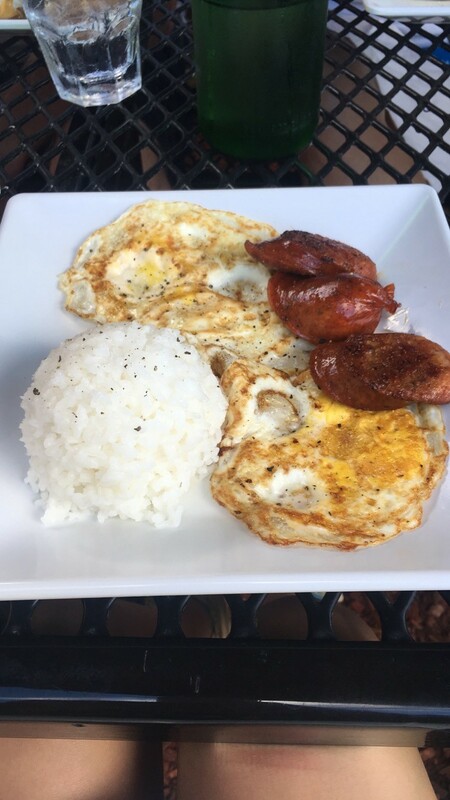 Anuenue Café (In Poipu in Koloa in the back of Poipu Shopping) – This is where I discovered my love for Hawaiian Breakfast. 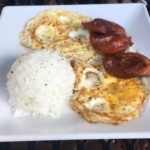 STICKY RICE, PORTUGESE SAUSAGE AND EGGS! YES. YES. YES. 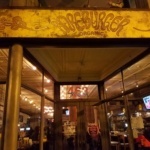 I could go on and on about great restaurants but a few others you should try: Pietro’s Pizza, Chicken in a Barrel BBQ, Brennecke’s Beach Broiler and Bubba’s Burgers! Now on to Beaches and the Fun! 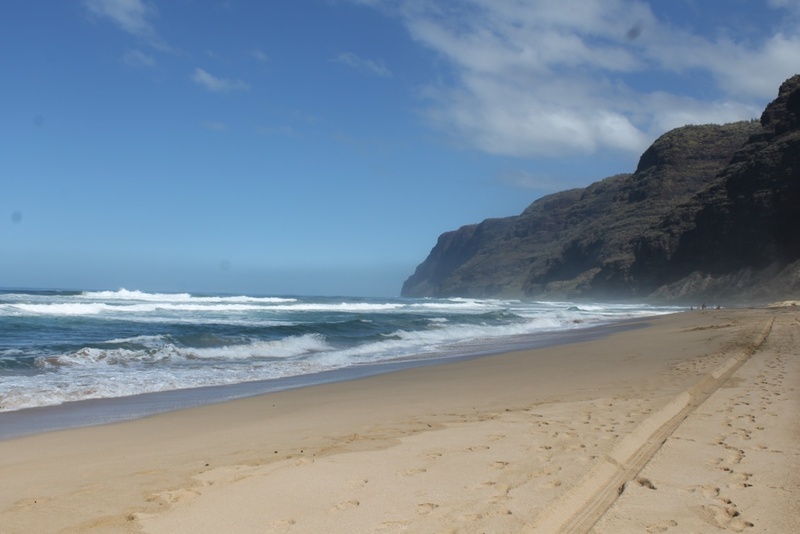 Polihale State Park (Waimea) – Please drive there (but take a Jeep or a Truck or even hitch a ride in the back of a truck!) It is down a LONG bumpy road, which is not a good mix if you have to pee! But well worth the ride to the isolated white sand beach with a fantastic backdrop of cliffs! Swimming isn’t necessarily recommended at this beach though for the rough waters. 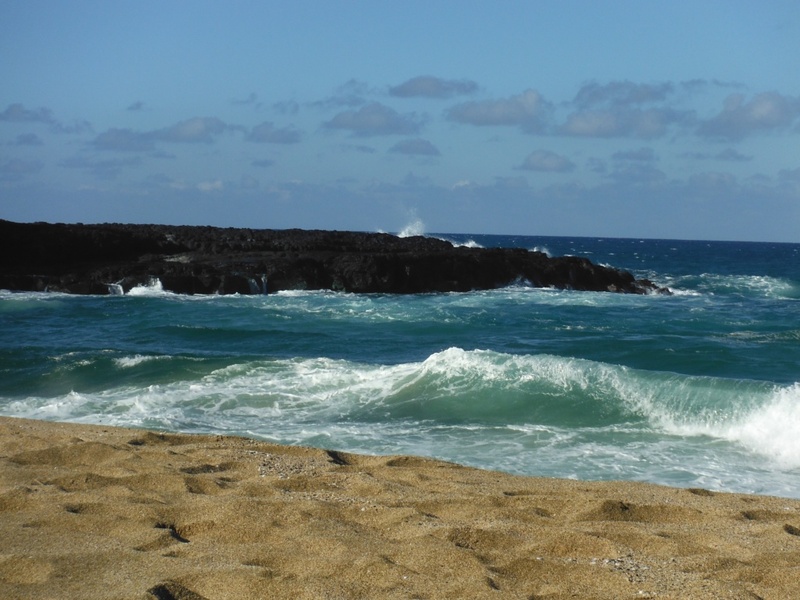 Larsen’s Beach (Kilauea) – Let’s keep this one a secret. It’s quiet and a little bit of a hike to get down to it. But if planning to visit Kauai, go soon! For the locals fear that Zuckerberg is trying to make it not accessible to public anymore. 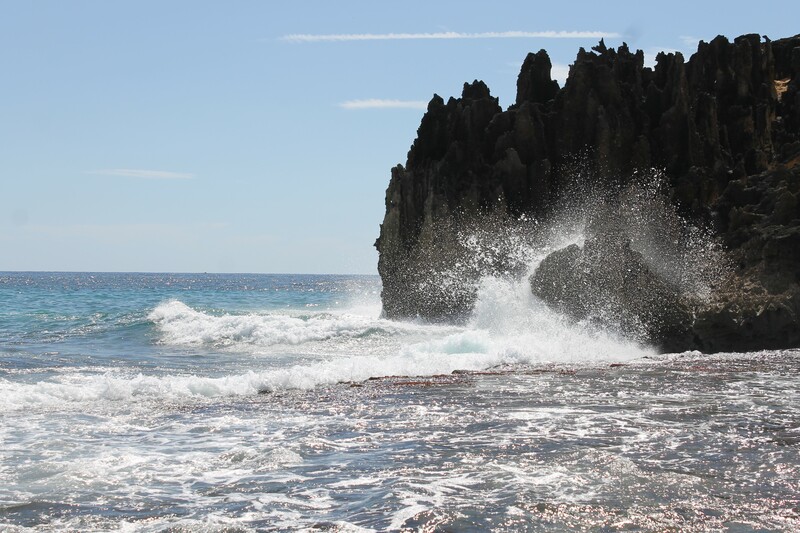 HIKE at Shipwrecks Beach– My parents and I took in an EXCELLENT and BEAUTIFUL hike starting out at Shipwrecks Beach along the cliffs and beach. We went off the path a lot to get closer view of the water. Try out the cliff jump if you are up for it, all the locals are! I however, chickened out. 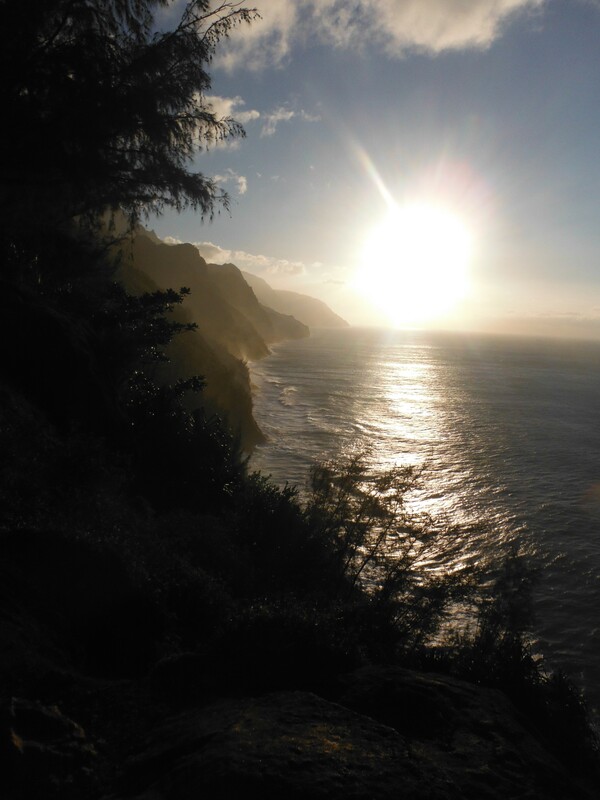 ALSO, HIKE THE KALALAU TRAIL ON THE NA PALI COAST! JUST DO IT. No explanation needed. Then hop in Ke`e Beach! ATV’ing on the Kipu Ranch! – So. Much. Fun. We had two excellent guides which made for an even better experience. 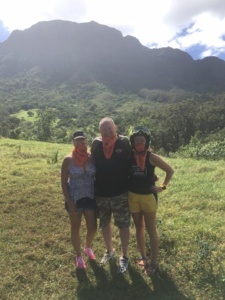 We did the Waterfalls Picnic Tour and took in all sorts of gorgeous untouched beauty on the Kipu Ranch (many movies were filmed here) via ATV’s. We also took a swing on the Indiana Jones rope into the Kuleia River and splish-splashed under a waterfall! recommended before all the crowds join in and you hike to a waterfall hole that is practically empty! As you can see, I could go ON and ON about Kauai. But I will just let you go and experience the rest for yourself!